jQuery size() vs length - I have seen a lot of jQuery developers getting confused over the usage of the jQuery size() function and length property. 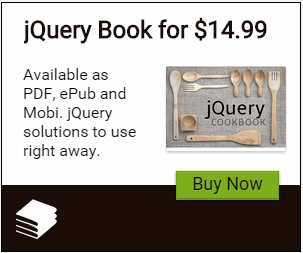 Both of these return the count of elements on the page or jQuery object. CSS First-Letter First-Line Pseudo Elements - CSS Pseudo Elements are used to modify and add special effects to some selectors. For example to modify the first line or letter of a paragraph, you can use the :first-line and :first-letter pseudo elements. You can either increase the font size or even apply an image if you wish. Silverlight 4: Binding Enum with ComboBox - In this article, we will explore the mechanism of Binding Enumeration data with the ItemsControls family in Silverlight. Enum is used to store constant type of data with integer values as its contents For e.g. Department values like IT, System etc. can be stored in Enum and can be used as constants in your application code. Data Validation in Silverlight using Data Annotations and Data Form - While using Silverlight for developing Line-of-Business applications, the DataForm control is recommended for performing DML operations. This control provides data pagination, insert, and update and delete operations on the records. This control provides ItemsSource property which accepts collection type as an input e.g. ObservableCollection. WPF 4: Change Hyperlink Text and URL using DataBinding - Let us assume we want to create a WPF UI with a ListBox containing list of web sites. This ListBox must contain Hyperlinks and it should be possible to change the Text and URL of these hyperlinks dynamically. Thankfully in WPF, we have the Hyperlink control element which can be clicked and the user navigated to a URL. Silverlight 4: Creating Word Documents in MyDocuments Folder - Silverlight 4.0 supports COM automation. Using this feature we can interact with MS-Word, Excel etc via our application. The business requirement behind this isinteraction that a lot users prefer to store their data in Word or Excel format for immediate accessibility and modification. ASP.NET 4: Register HTTP Module at Runtime without Editing your Web.config - The ASP.NET pipeline allows HTTP modules to be plugged-in to a request and intercept or modify each individual request. Modules can be used for processes like caching, authentication etc. 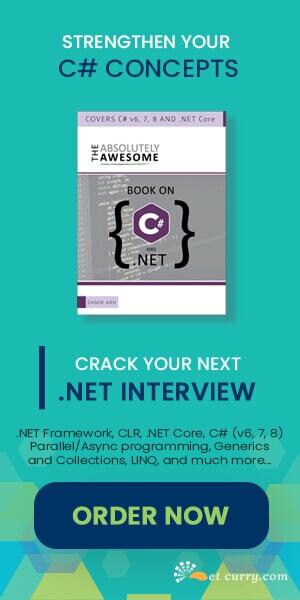 Not known to many developers, ASP.NET 4.0 provides the PreApplicationStartMethodAttribute which allows you to run code even before any app_start event gets fired or any dynamic compilation occurs (App_code). List<T>.ConvertAll<>() with Lambda Expression - List<T> has many useful methods for dealing with sequences and collections. One such method is the ConvertAll<>() method. All those who have used the List<T>.ConvertAll<>() are aware how useful this method is to convert the current List<T> elements to another type, and return a list of converted elements. SharePoint 2010 Technical Library Available as CHM - Microsoft has made available the SharePoint Foundation 2010 technical library as a downloadable CHM. WCF 4.0 REST POX Service with Help Page - Representational State Transfer (REST) support was included in WCF 3.5. In WCF 4.0, this feature has been enhanced with Help page support. This facility was added as WCF REST allows direct call to OperationContracts, using HTTP protocol by the client application. JSON Enabled WCF 4 Service - The advantages of using JSON enabled WCF service is that the data is communicated in plain text like stream, it does not require any data/message parsing. For exposing a WCF service as JSON enabled WCF service, we need to apply the [WebGet] attribute on the method of the ServiceContract with ResponseFormat as JSON. Coded UI Tests (CUIT) In Visual Studio 2010 - Coded UI Tests (CUIT) is a brand new feature added in Visual Studio 2010 Ultimate or Premium version which allows you to test a a User Interface using automated tests. CUIT allows functional testing for UI and the code gets created with the help of high level languages like C# or VB.NET. LINQ: Calculate Average File Size in C# - Let us see a simple code using LINQ and C# that calculates the average FileSize of the files kept in a folder. Windows Azure Sample Project - .NET Stock Trader 5 Sample Application - Ask an experienced programmer and he/she will tell you that the best way to learn a new technology is by getting some hands-on experience in it. Microsoft has released a .NET Stock Trader 5 Sample SOA application that is an end-to-end sample application illustrating Windows Azure Platform Cloud Migration and Integration and will give you a good head start as well as demonstrate how to create scalable, connected systems on the cloud, with best practices. SharePoint 2010 Application Templates for Health Organization - SharePoint 2010 Application templates are out-of-the-box custom scenarios that are created to address the business process requirements of a particular business industry – say the Health sector. These templates facilitate the business process owners and developers to build deeper SharePoint-based solutions. LINQ: Compare two Sequences - How do you compare two sequences using LINQ? The answer is by using the Enumerable.SequenceEqual(). SequenceEqual() compares the source and target sequences elements, by using the default equality comparer for their type, and returns a Boolean. LINQ: Generate Odd Numbers using Parallel Execution - A couple of months ago, I had written on Generate Odd Numbers within a Range using LINQ. In that post, I had demoed how to ‘sequentially’ generate odd numbers within a Range. Microsoft Security Development Lifecycle (SDL) - As software developers, you must address security and privacy threats in your applications. There are many guidelines available of Security Development Lifecycle, but here’s nice 160 page whitepaper from Microsoft that outlines the SDL process used by Microsoft product groups for application development. Virtual Machine for Visual Studio 2010 and TFS 2010 - Microsoft has released a newer RTM version of its Virtual Machine consisting of Visual Studio 2010 and Team Foundation Server (TFS) 2010. This VM also contains new hands-on-labs, demos, power tools, feature packs and updates, VS 2010 SP1, and Team Foundation Server 2010 Service Pack Lab. Java to .NET Migration WhitePaper–Trends and Benefits - I stumbled upon an interesting whitepaper written by Pique solutions. It spoke about the trends and insights and the strategic investments being made by companies, while doing a development platform migration from Java to .NET. IE10 Platform Preview 2 Released with better HTML 5 support - Microsoft just released Preview 2 of the new Internet Explorer 10 and it's getting better!